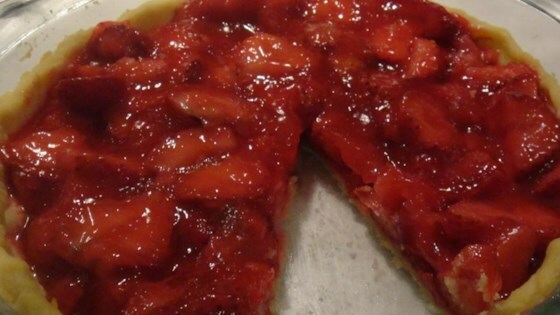 "The carbonated lemon-lime soft drink gives this strawberry pie a bit of a kick!" In a medium saucepan, cook carbonated beverage, sugar and cornstarch over medium heat until thickened. Remove from heat and stir in gelatin. Place strawberries in pie crust and pour gelatin mixture over top of them. Spread whipped topping over strawberry layer; cover and refrigerate overnight or for several hours before serving. See how to make a wonderfully sweet and tart fruit pie. Turned out good, even with diet soda and splenda! The cornstarch made it too thick! I could not tast the soda. I will not be making this recipe again. I have been looking for this recipe for years! I made this when I was still in high school, and then lost the recipe. I have also made this with peaches. Great, great recipe for the summer!